Halloween is one of the most exciting holidays we celebrate here in Florida. From ghosts to vampires to clowns and fairies, families are fully costumed and ready for a night of fun. So let’s make sure our students and parents stay as safe as possible while out in our communities with a few helpful Halloween Safety Tips. Proper planning. Parents try and map out your routes prior to Halloween. It is much easier to know where you are heading and how you can get the most out of your night of fun. Parents try to decorate costumes and bags with reflective tape or stickers for visibility at night. Have dinner first. A good meal prior to trick-or-treating will discourage children from filling up on sugary treats. Make sure that you or a guardian attends the trick or treating with your child if they are under the age of 12. There should always be adult supervision for child safety. Older children, be sure to carry a cellphone. Use good traffic judgment. Walking on the sidewalk or on the left side of the road facing traffic and obeying road signs are great tips to having a safe Halloween. Avoid dark and unlighted homes. The homeowners are likely gone or not participating in the evening festivities. Be respectful and courteous…even if the treats are not to your liking. Patience is key. Try to avoid eating all the treats you receive on Halloween. Too much candy in one sitting can never be a good thing. Try to ration the goods for the days following Halloween. Parents should inspect all the treats. Throw away any unwrapped, open or suspicious looking treats. Stay alert. If there are any suspicious activities or unlawful activities, please notify law enforcement authorities. Most importantly, have fun! Halloween is full of surprises and excitement. Done safely, it can be one of the best celebrations of the year. Trick-or-treat peak hours are usually 5:30pm to 9:30pm so be especially alert on the roadway. Slow down in residential neighborhoods. Children are excited on Halloween and may move in unpredictable ways. Take extra time to look for kids at intersections and curbs. If you cannot see them, they likely cannot see you. Watch for stopped vehicles. The driver might be dropping off children. And, if you are dropping of children, please use your hazard lights. Park your phone. You do not need any distractions while operating your motor vehicle. Please wait until your vehicle is at a complete stop to call, text, or surf. Throughout Florida’s history, many Hispanic leaders have made great contributions to the Hispanic community and helped our state become what it is today – a place known for its rich culture, vast history and dynamic people. At the Department of Education, we are proud to celebrate Hispanic history during Hispanic Heritage Month, September 15 to October 15. Although I am not currently instructing students in the classroom, I will always be an educator at heart, so I want to provide a brief history lesson in this post. September 15 was chosen as the starting point for Hispanic Heritage Month because it is the anniversary of independence of five Latin American countries: Costa Rica, El Salvador, Guatemala, Honduras and Nicaragua. In addition, Mexico and Chile celebrate their independence days on September 16 and September 18 respectively. The observation first began in 1968 when President Lyndon B. Johnson and the U.S. Congress declared Hispanic Heritage Week in September. Twenty years later, President Ronald Reagan extended the week to a 30-day period. For as long as we all can remember, Florida has been known as the Gateway to Latin America. The food, music and traditions provide a critical link between the United States and South America. These strong relations with South America enable Florida to exercise a unique model of two-way trade, greatly promoting economic growth. We are working every day to prepare Florida students to compete in a global economy, and Hispanic Heritage Month provides educators and parents an exciting opportunity to expand our students’ knowledge of the world in we which all live and work. Parents are filling the vehicle drop-off zones, teachers are organizing the books and desks, and students are flooding the hallways and classrooms. All things are set in motion to begin yet another amazing school year in Florida. 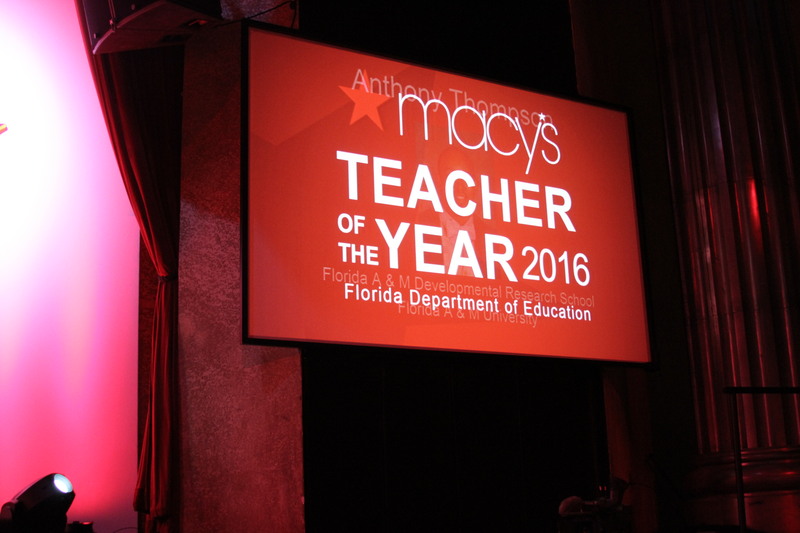 For many educators, this time of year is both exciting and a bit stressful, so we recruited 2016 Florida Teacher of the Year Diane McKee, a 14-year teaching veteran, to share her top tips to help new educators have the best teaching experience possible. We hope this list will help guide you as you settle in to the new academic year. Have a helpful tip we left off? We’d love to hear from you – leave a message in the comments section and everyone can benefit! Set the tone. To make sure students feel comfortable in your classroom, greet them at the door, make eye contact, call them by their names and be sure to smile. Creating a safe environment from the start to ensure students know they can share ideas and ask questions freely. It’s also a good idea to take some time to let the students know who you are as a person. Sharing why you became a teacher can be a great start. Use class builders. Classes are just beginning and students are likely to feel shy or apprehensive with a new teacher and, in many cases, new classmates. Use short icebreakers, team builders and class builders to establish a collaborative environment. Establish a clear routine. Define a clear set of guidelines and procedures for entering and exiting the classroom, managing classroom materials, and everything in between. Practice it repeatedly until it becomes routine – for you and the students. Your students will feel organized and the rest of the year will run more smoothly as a result. Set high expectations. The most effective teachers are often the ones students think are the most difficult. Challenging your students will teach them lessons that will serve them well as they continue their education and, one day, pursue careers. Be flexible. Great teachers are always willing to be flexible. If a lesson isn’t working out quite as you’d planned, don’t be afraid to throw it out, regroup and try another approach that may reach your students better. Communicate with parents. Parents can be your biggest allies, so it’s important to contact them within the first few weeks of school to make sure they know how to reach you with questions or concerns about their student. Establishing trustworthy relationships with parents early on creates a collaborative environment that enables you both to ensure students get the most of their educational experience. Positive peer collaboration. Open yourself up – share and collaborate with your grade-level team or other staff members and don’t be afraid ask for help when you need it. You will likely find that you have similar experiences to your peers and that the road to success is easier when you are not going it alone! Set clear objectives. Have a clear focus posted for each day’s lesson that clearly connects to previous lessons. Many students need to know the direction you intend to take and why in order to “buy in” to your plan. Maintain a strong work ethic. Always have a “never say die” attitude. Teaching can be a draining job and there will be times that you feel it requires everything you have and then some. Always remember that the most important tasks are rarely the easiest, and your students are relying on you to help them become tomorrow’s leaders. Take care of yourself. Teacher burnout is not a myth, but it can be avoided. Be sure to schedule some “me” time each week to reenergize and relax.